EL PASO, Texas — Democratic presidential candidate Beto O’Rourke declared that immigrants make the country safer as he staged rallies across Texas on Saturday to formally kick off his 2020 White House bid, looking to shore up his deeply conservative home state and champion the U.S.- Mexico border at a time when President Donald Trump has threatened to shut it. The former congressman, who represented El Paso for three House terms until last year, began the day addressing 1,000-plus supporters in his hometown, across the border from Ciudad Juarez, Mexico. He was holding an event at historically black Texas Southern University in Houston later, before heading to Austin for a third rally in the shadow of the red-granite state Capitol. “We have learned not to fear our differences, but to respect and embrace them,” he told a crowd that waved small American flags and black-and-white signs reading “Viva Beto” while often interrupting their candidate to chant his first name. O’Rourke has made promoting the U.S.-Mexico border as culturally rich and economically powerful the centerpiece of his campaign and spoke on a downtown street corner a few blocks from the border. 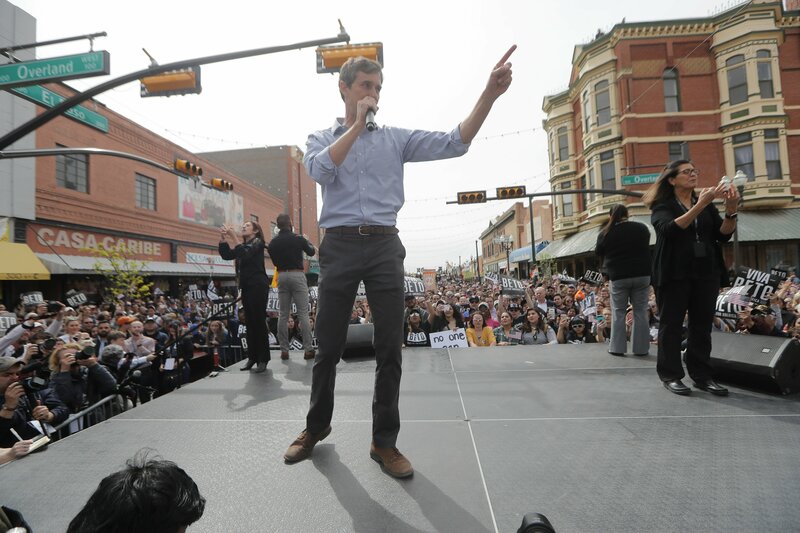 O’Rourke entered the race March 14 and already has visited nine states, but had promised to return to El Paso for an official kickoff. A small but vocal group of Trump supporters had other ideas, gathering a few blocks away from the event to shout anti-O’Rourke sentiments for hours. Despite such nods to bipartisanism, however, O’Rourke offered many positions Saturday that were liberal enough to make moderates nervous. He vowed to legalize marijuana nationally, defend abortion rights, sign new voting rights legislation to end partisan gerrymandering and allow same-day voter registration, institute federally financed, universal pre-kindergarten programs, strengthen unions and bring home all troops from the U.S.-led wars in Iraq and Afghanistan. He also renewed his support for a House proposal called “Medicare for America,” which he says will guarantee universal health care coverage while allowing people who like getting insurance through their employer to continue doing so. Texas hasn’t elected a Democrat to statewide office in 25 years. But O’Rourke came within 3 percentage points of topping Cruz, and national Democrats are hoping that its booming Hispanic population and large numbers of new residents moving in from other states could keep Texas close in 2020 — potentially reshaping the electoral college. California Sen. Kamala Harris dew a large crowd last weekend when she too visited Texas Southern University.